At our school we have an excellent tradition in music. Our music curriculum comprises performing, composing, listening and appraising. We aim to engage children in the process of making and responding to music by offering opportunities for children to sing and play musical instruments. Children are taught to listen carefully and experience a wide range of music from different times and cultures. 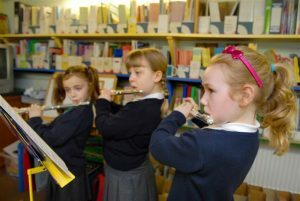 A range of extra-curricular musical activities are offered such as infant and junior choir, and children are actively encouraged to become involved. These groups meet regularly and perform at a range of special events in school and in the local community to celebrate their achievement. Instrument tuition is provided by a peripatetic teacher for those children expressing an interest in learning a wide variety of instruments. This year, we are looking forward to creating a range of instrumental ensembles to enable the children to perform together.